But upon the table—oh joy! the tailor gave a shout—there, where he had left plain cuttings of silk—there lay the most beautifullest coat and embroidered satin waistcoat that ever were worn by a Mayor of Gloucester. There were roses and pansies upon the facings of the coat; and the waistcoat was worked with poppies and corn-flowers. The dark goatskin is richly tooled in gold, with ocher, yellow, and red onlays, some once painted either blue-green or silver that has since oxidized. Hollow gold stems and leaves wind across the cover, sprouting the onlaid flowers and gold-tooled leaves. The central lozenge is a fanfare-esque mass of crimson onlaid strapwork surrounding a delicately scalloped, engraved silver center piece. Other silver furniture includes similarly-patterned corner pieces and clasps. 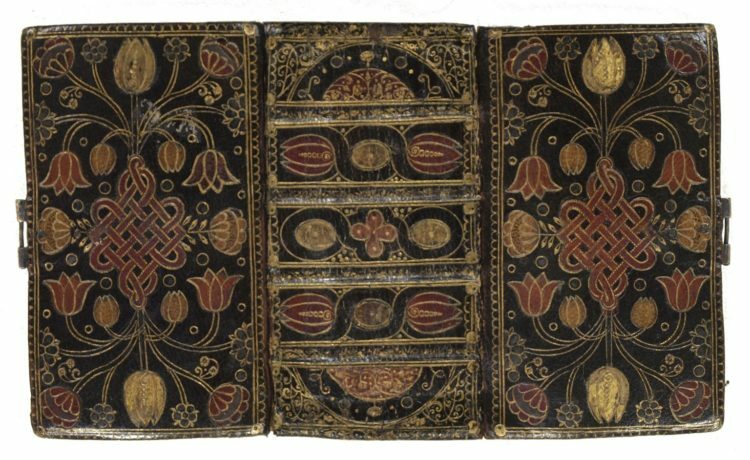 The spine is divided into seven panels, with the bottom and top-most panels tooled in gold with four delicate, double-lined semi-circlular rolls, each containing a semi-circular floral stamp. The internal five panels contain a pattern of fanfare-esque rolling, hollow strapwork, punctuated with red and ocher quatrefoils, themselves tooled with a floral stamp. Front cover of Folger 270054. Photo by Elizabeth DeBold. Spine detail, Folger 270054. Photograph by Elizabeth DeBold. The sumptuous decoration doesn’t stop here, continuing to the fore-edge, which is painted under gilt in red, green, and black. The decor here includes two winged cherubs suspended next to a flaming heart, inscribed with the words “Search the Scriptures 1682.” The flowers surrounding this image include roses, pansies, tulips, and peonies. Fore-edge of Folger 270054. Photograph from Bernard Quaritch Ltd., Winter Catalogue 2018. A king, much less the mayor of Gloucester, would be proud to own it. When considering this item for purchase, we were drawn to it primarily because it is a gorgeous example of an English Restoration binding, but also due to its resemblance to another item in our collection: Folger V.a.615, a physically small sammelband of sixteen educational texts from approximately the same period, affectionately nicknamed “the Brick” for its shape and size. Likely assembled by a tutor, this item contains significant manuscript content (including pedagogical notes and curricula), in addition to its printed texts. 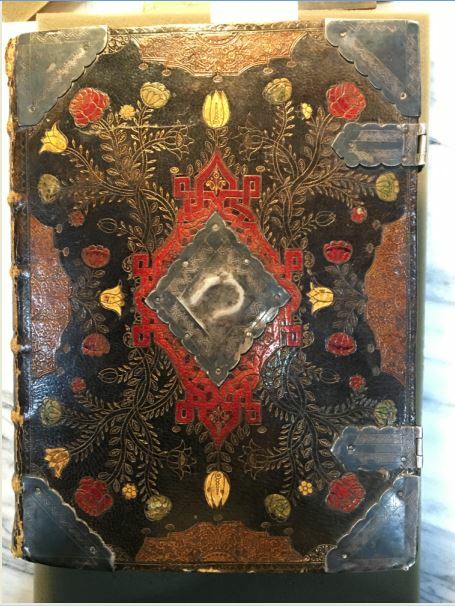 You can read more about this fascinating item and its contents in Heather Wolfe’s Collation post from 2012, “Such a lucky pretty little library…” In terms of content and purpose, these volumes could not be more different. This makes the similarities in their bindings all the more fascinating. Open covers, Folger V.a.615. Photograph by Frank Mowery. Fore-edge, Folger V.a.615. Photograph by Frank Mowery. The Naval Binder (or his workshop) favor floral designs such as those picked out with colorful onlays on our two bindings here, but so too did other binders from the period, including binders such as “Queen’s Binder B” and “Elizabeth Dickinson’s Binder,” among many others. 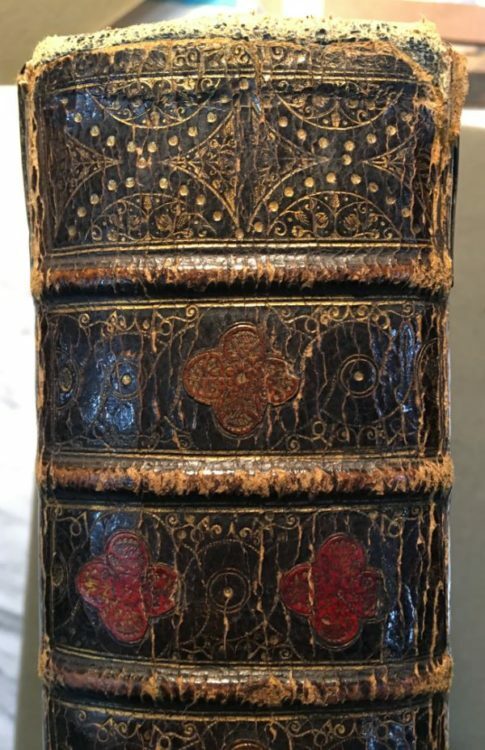 Neither of the Folger’s two bindings include the “centre-pieces of massed small tooling,” although they do both have (different) “tightly-budded floral volute[s],” used on colored onlays, both of which were characteristic of the Naval Binder’s workshop. They do both include distinctive, central, crimson fanfare-esque strapwork. They also share a hollow stem design, absent from other examples of the Naval Binder’s floral work, and a curlicue tool used in the center of the tulips. On the spines, both include similar again fanfare-esque designs, with quatrefoils and semi-circles. Similar bindings at other institutions include Gibson 77 at the Bodleian Library (kindly brought to my attention by Donovan Rees at Quaritch) and Davis 70 at the British Library, but again, these bindings both include the distinctive narrow central oval, large corner and center-pieces with massed tooling, and no such fanfare-like details as the red strapwork, hollow stems, or tooling on the spine. Regarding the similarities, Gibson 77 (also a bible) includes a similar curlicue tool (although used differently), and a fore-edge painting with the words “Search the Scriptures,” while Davis 70 (another bible) includes similarly-shaped silver furniture and another “Search the Scriptures” fore-edge painting. 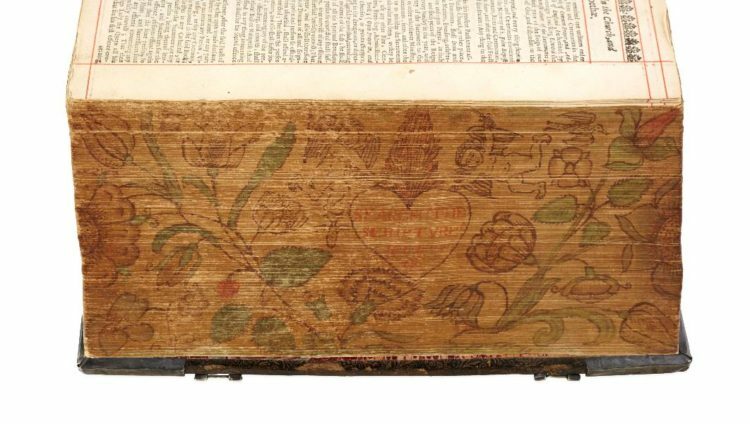 Neither fore-edge paintings include cherubs, though they do have handsome floral designs. Clearly, the bindings of Folger 270054 and V.a.615 are closely related in some way, and they appear to be more like one another than like other examples from the same period. Perhaps they were made by the same craftsman—it certainly seems more than possible that they were produced in the same workshop. It could have been that of the Naval Binder, although V.a.615 was previously identified as the work of the Mearnes before coming to the Folger, but it seems just as likely that they hail from a different workshop altogether. David Pearson, in his excellent work English Bookbinding Styles 1450-1800, reminds us that “[g]iven the social status of bookbinders…it should not be surprising that the great majority of binders of the early modern period are very obscure people, biographically, about many of whom we know next to nothing, if that.”2 Another possibility is that the owner of one item saw the other of these volumes and admired the design: the works in Folger 270054 were all published in 1682, while the youngest work in V.a.615 was published in 1684. It’s possible that V.a.615’s compiler saw Folger 270054, and requested that his little volume be modeled on the same patterns, or vice versa. In the end, perhaps what matters most is that such attention and expense implies that the owners of these volumes valued them very highly, either as aesthetic objects or due to the contents (or both), despite being very different collections of works. As always, writing this post has raised more questions than answers for me, and there is deeper work to be done. Howard M. Nixon, Five Centuries of English Bookbinding (London: Scolar Press, 1978), 97-99. David Pearson, English Bookbinding Styles 1450-1800 (New Castle, DE: Oak Knoll Press, 2014), 174. Elizabeth DeBold is the Assistant Curator at the Folger. The fore-edge paintings highlighted here remind me of one on a copy of the Eliot Bible that I profiled for the University of Illinois’s Rare Book & Manuscript Library back in 2016: http://illinoisrbml.tumblr.com/post/119287733611/todays-featured-item-is-known-as-the-eliot-bible It also features floral decoration and a cherub. The binding, however, is not nearly as elaborate. Thanks so much for this information! 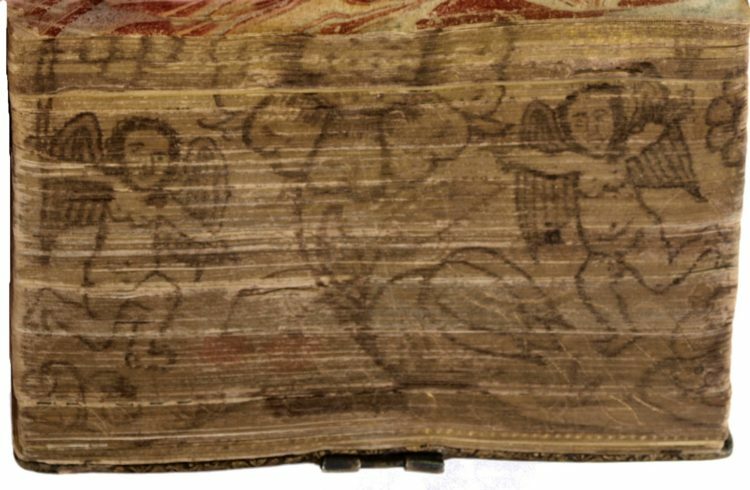 The fore-edge painting really does look similar to our two, especially the cherubs. Although the binding you worked on is a bit less elaborate, it does have some similar fanfare designs similar to those on the spines of ours. It would be interesting to compare them more closely.